When assessing the influence of selected factors on capital structure, the researcher has to choose the set of determinants taken into account, their operationalization and the estimation method for regression model. However, the results vary significantly when the model is estimated with ordinary least squares, fixed effects or generalized method of moments. This study compares the results of parameter and standard errors estimates for the capital structure determinants models. Lagged debt ratio and size have positive impact on debt ratio, while profitability, business risk and industry median debt ratio have negative impact on debt ratio for companies listed in Poland. 1. Ahn, S. C., and Schmidt, P., „Efficient estimation of models for dynamic panel data”, Journal of Econometrics, 68(1), 5-27, 1995. 2. Anderloni, L., and Tanda, A., „The Determinants of Leverage: A Comparative Analysis”, Journal of Economics and Management, 18, 195, 2014. 3. Antoniou, A., Guney, Y., and Paudyal, K., „The determinants of capital structure: capital market-oriented versus bank-oriented institutions”, Journal of Financial and Quantitative Analysis, 43(01), 59-92, 2008. 4. Arellano, M., and Bond, S., “Some tests of specification for panel data: Monte Carlo evidence and an application to employment equations”, The Review of Economic Studies, 58(2), 277-297, 1991. 5. Baltagi, B., „Econometric analysis of panel data”, John Wiley and Sons, 2008. 6. Blundell, R., and Bond, S., “Initial conditions and moment restrictions in dynamic panel data models”, Journal of Econometrics, 87(1), 115-143, 1998. 7. Chang, X., and Dasgupta, S., „Target behavior and financing: how conclusive is the evidence?”, The Journal of Finance, 64(4), 1767-1796, 2009. 8. Chang, Y. K., Chou, R. K., and Huang, T. H., „Corporate governance and the dynamics of capital structure: New evidence”, Journal of Banking and Finance, 48, 374-385, 2014. 9. Dang, V. A., Kim, M., and Shin, Y., „Asymmetric capital structure adjustments: New evidence from dynamic panel threshold models”, Journal of Empirical Finance, 19(4), 465-482, 2012. 10. De Jong, A., Kabir, R., and Nguyen, T. T., „Capital structure around the world: The roles of firm-and country-specific determinants”, Journal of Banking and Finance, 32(9), 1954-1969, 2008. 11. Deesomsak, R., Paudyal, K., and Pescetto, G., „Debt maturity structure and the 1997 Asian financial crisis”, Journal of Multinational Financial Management, 19(1), 26-42, 2009. 12. Elsas, R., and Florysiak, D., „Empirical capital structure research: New ideas, recent evidence, and methodological issues”, Munich School of Management Discussion Paper, (2008-10), 2008. 13. Farhat, J. B., Cotei, C., and Abugri, B. A., „Testing trade-off and pecking order models under different institutional environments”, available at SSRN 1404596, 2009. 14. Faulkender, M., Flannery, M. J., Hankins, K. W., and Smith, J. M., „Cash flows and leverage adjustments”, Journal of Financial Economics, 103(3), 632-646, 2012. 15. Flannery, M. J., and Hankins, K. W., „Estimating dynamic panel models in corporate finance”, Journal of Corporate Finance, 19, 1-19, 2013. 16. Flannery, M. J., and Rangan, K. P., „Partial adjustment toward target capital structures”, Journal of Financial Economics, 79(3), 469-506, 2006. 17. Frank, M. Z., and Goyal, V. K., „Capital structure decisions: which factors are reliably important?”, Financial Management, 38(1), 1-37, 2009. 18. Hahn, J., Hausman, J., and Kuersteiner, G., „Long difference instrumental variables estimation for dynamic panel models with fixed effects”, Journal of Econometrics, 140(2), 574-617, 2007. 19. Haron, R. Capital structure inconclusiveness: evidence from Malaysia, Thailand and Singapore”, International Journal of Managerial Finance, 10(1), 23-38, 2014. 21. Hovakimian, A., Hovakimian, G., and Tehranian, H., „Determinants of target capital structure: The case of dual debt and equity issues”, Journal of Financial Economics, 71(3), 517-540, 2004. 22. Huang, R., and Ritter, J. R., „Testing theories of capital structure and estimating the speed of adjustment”, Journal of Financial and Quantitative analysis, 44(02), 237-271, 2009. 23. Hurlin, C., „Dynamic panel data models”, materials for the lecture at University of Geneva, www.univ-orleans.fr/deg/masters/ESA/CH/Geneve_Chapitre2.pdf, accessed 25.10.2016, 2010. 24. Kayhan, A., and Titman, S., „Firms’ histories and their capital structures”, Journal of Financial Economics, 83(1), 1-32, 2007. 25. La Rocca, M., La Rocca, T., Gerace, D., and Smark, C., „Effect of diversification on capital structure”, Accounting and Finance, 49(4), 799-826, 2009. 26. Lemma, T., and Negash, M., „Determinants of the adjustment speed of capital structure: Evidence from developing economies”, Journal of Applied Accounting Research, 15(1), 64-99, 2014. 27. Leary, M. T., and Roberts, M. R., „Do firms rebalance their capital structures?”, The Journal of Finance, 60(6), 2575-2619, 2005. 28. Lemmon, M. L., Roberts, M. R., and Zender, J. F., „Back to the beginning: persistence and the cross‐section of corporate capital structure”, The Journal of Finance, 63(4), 1575-1608, 2008. 29. Lucas, D. J., and McDonald, R. L., „Equity issues and stock price dynamics”, The journal of Finance, 45(4), 1019-1043, 1990. 30. MacKay, P., and Phillips, G. M., „How does industry affect firm financial structure?”, Review of Financial Studies, 18(4), 1433-1466, 2005. 31. Mazur, K., „The determinants of capital structure choice: evidence from Polish companies”, International Advances in Economic Research, 13(4), 495-514, 2007. 32. Myers, S. C., and Majluf, N. S., „Corporate financing and investment decisions when firms have information that investors do not have”, Journal of Financial Economics, 13(2), 187-221, 1984. 33. Myers, S. C., „Financing of corporations”, Handbook of the Economics of Finance, 1, 215-253, 2003. 34. Myers, S. C., „The capital structure puzzle”, The Journal of Finance, 39(3), 574-592, 1984. 35. Nickell, S., „Biases in dynamic models with fixed effects”, Econometrica: Journal of the Econometric Society, 1417-1426, 1981. 36. Ozkan, A., „Determinants of capital structure and adjustment to long run target: evidence from UK company panel data”, Journal of Business Finance and Accounting, 28(1‐2), 175-198, 2001. 37. 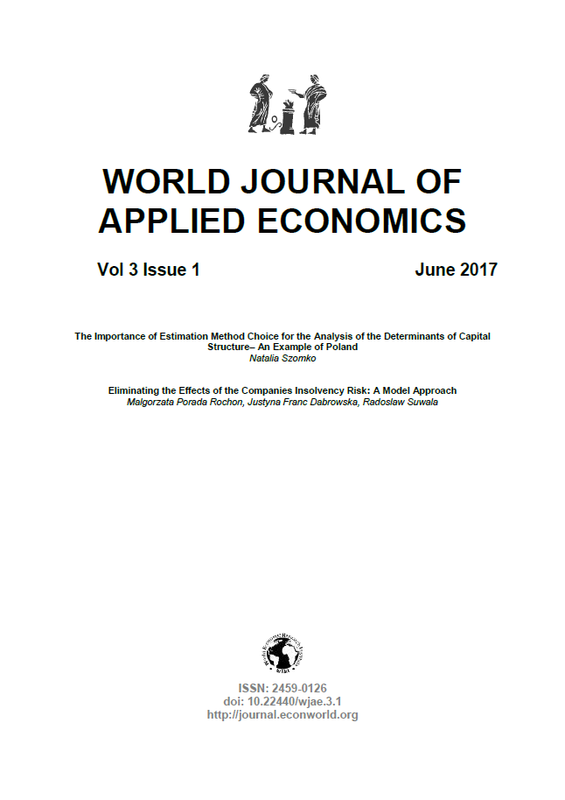 Öztekin, Ö., and Flannery, M. J., „Institutional determinants of capital structure adjustment speeds”, Journal of Financial Economics, 103(1), 88-112, 2012. 38. Rajan, R. G., and Zingales, L., „What do we know about capital structure? Some evidence from international data”, The Journal of Finance, 50(5), 1421-1460, 1995. 39. Rashid, A., „Firm external financing decisions: explaining the role of risks”, Managerial Finance, 40(1), 97-116, 2014. 40. Roodman, D., „How to do xtabond2: An introduction to difference and system GMM in Stata”, Center for Global Development Working Paper, (103), 2006. 41. Santos, M. S., Moreira, A. C., and Vieira, E. S., „Ownership concentration, contestability, family firms, and capital structure”, Journal of Management and Governance, 18(4), 1063-1107, 2014. 42. Shyam-Sunder, L., and Myers, S. C., „Testing static tradeoff against pecking order models of capital structure”, Journal of Financial Economics, 51(2), 219-244, 1999. 43. Welch, I., „Capital structure and stock returns”, Journal of Political Economy, 112(1), 106-132, 2004. 44. Wintoki, M. B., Linck, J. S., and Netter, J. M., „Endogeneity and the dynamics of internal corporate governance”. Journal of Financial Economics, 105(3), 581-606, 2012.